The chief executive of Hawaii Medical Service Association got a salary, bonus and other compensation worth $1.16 million last year, according to documents filed with the state. That has prompted a state lawmaker to call for stripping the state's largest health insurer of its exemption from state tax. And the head of the agency that oversees health insurance rates, which HMSA recent sought to increase, says it is "legitimate to question" its executives' pay levels. The top three executives of the Hawaii Medical Service Association received incremental pay increases of 2 percent to 5 percent last year, pushing its chief executive's compensation to $1.16 million in 2007. HMSA's executives' pay levels have prompted a state lawmaker to call for the suspension of the health plan's exemption from the state premium tax and an investigation into its use of lobbying to influence attempts to reform health care. House Health Chairman Josh Green (D, Keauhou-Honokohau) said HMSA's executive salaries are excessive, and that the health plan has blocked any attempt to increase medical reimbursements to providers through legislation. HMSA says subjecting it to the tax would be counterproductive. "Our goal has always been and remains today to be to provide affordable quality health-care coverage for our members," said HMSA spokesman Michael Stollar. "Applying a tax to us will increase the cost of that health care for literally 16,000 employer groups and 700,000 Hawaii residents." HMSA's president and chief executive officer, Robert Hiam, received a 3 percent compensation increase to $1.16 million in 2007, up from $1.12 million in 2006. "I can't say that it is out of line given the complexity of the organization that the executives have to manage," said state Insurance Commissioner J.P. Schmidt. "However, I think it is legitimate to question executive pay, particularly for a nonprofit company, and to look at how they operate in the community." Over the past decade, the state's largest health insurer has saved $560 million in taxes because of its status as a not-for-profit, mutual benefit society, according to the state Insurance Division. The HMSA Foundation gives out $1.2 million per year in grants, but saves $80 million from exemptions from the premium tax, Green said. "They're paying their CEO as much as the whole charitable wing," Green said. "Meanwhile, the taxpayers are bailing out our hospitals, which are on life support." By comparison, Janet Liang, who became president of Kaiser Permanente Hawaii in March 2007, received $661,700 in total compensation for 2007, according to documents filed with the state Insurance Division. A Kaiser spokesman said that total included $327,989 in salary that covered the March-December period, plus one-time moving-related expenses of $333,711. 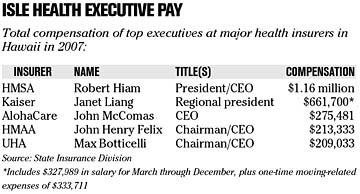 Max Botticelli, president and CEO of University Health Alliance, received $209,033 in total compensation, while John Henry Felix, CEO of the Hawaii Medical Assurance Association brought home a total of $213,333 last year. Compensation information for Nevada-based Summerlin Life and Health Insurance Co. wasn't available. 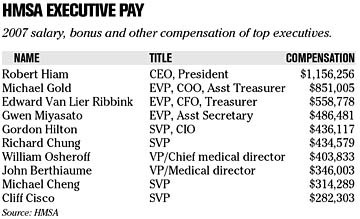 HMSA listed the total compensation for other CEOs at similarly-sized nonprofit organizations such as the Queen's Medical Center and Hawaii Pacific Health for 2006, which totaled $914,569 and $995,467, respectively. HMSA already has applied to boost rates by an average 9.2 percent for most of its large business groups renewing in the first five months of the year, citing substantial increases in medical payments to providers last year. The premium hike is the highest since 2002 when HMSA raised rates by 12.9 percent.